MTNOnDemand, has been there long before now many of you are very much familiar with it but for those of you that are not, then this post is right for you. The MTNOnDemand service allows you to recharge your MTN line from anywhere anytime you can easily credit yourself directly from your bank account. It very good and helps a lot mostly when you are in a place where you can't get airtime and you have might run out of credit/airtime on your Sim be it MTN, AIRTEL, GLO or 9Mobile you can easily credit yourself within a twinkle of your eyes, it very fast it don't require any internet connection. Though there are other channels of which you can recharge your Airtel, MTN, 9Mobile or Glo line. For example, you can recharge any network directly from your Bank account using your bank's Mobile Banking App, Quick Teller or USSD short code which stands to be "offline method". This service is designed for only MTN subscribers. If you use any of the banks mentioned above, you can easily topup your MTN line directly from your bank account by dialing *904*amount#. IMPORTANT: Make sure your MTN line is linked to the bank account and also make sure you have funds/money in your account for you not to get error while trying to top up. That's all. Very simple and more convenient. You don't need to switch on your data before using this service. It's completely offline on like the Mobile banking app that you will have to use internet connection. MTNOnDemand, has been there long before now many of you are very much familiar with it but for those of you that are not, then this post is right for you. 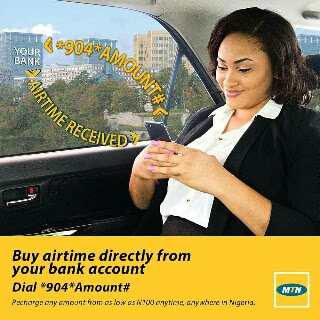 MTNOnDemand Lets You Buy Airtime Recharge Card Directly From Your Bank Account.